Wherever were flat ceilings and cast concrete there are curves and vaults now. 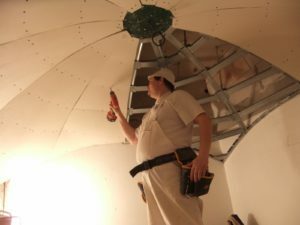 We build plasterboard vaults where it is not possible to do classical brick vault. Usually there are statical reasons or the ceiling is already constructed. We case the metal hanging construction with the plasterboard shell. Then it is covered by the mortar and stucco to make impression of the classical old-time vault. This way we can do also segmental sail vault or various types of vault. We can create different archs and curves from plasterboard. We are interested in that not to have our interiors too austere, to fill them with gracefullness.